MANILA: Philippine Catholic bishops called Wednesday on the faithful to boycott pop diva Madonna’s sexually charged concerts in the nation’s capital, calling them the devil’s work. The 57-year-old “Like A Virgin” and “Erotica” hit-maker is scheduled to cavort on a giant cross-shaped stage during two concerts on Wednesday and Thursday as part of her global “Rebel Heart” tour. “Pinoys (Filipinos) and all God-loving people should avoid sin and occasions of sin,” Archbishop Ramon Arguelles said in a statement posted on the Catholic Bishops Conference of the Philippines’ official website. “Why is the Catholic Philippines the favourite venue for blasphemy against God and the Holy Mother?” said Arguelles. Arguelles had previously campaigned against provocative pop diva Lady Gaga, saying her 2012 Manila concert was the work of Satan. Conservative bishops are famously outspoken in the Philippines, where 80 percent of its 100 million people are Catholic. Ahead of her concerts, Madonna visited a shelter for abused children and a Catholic orphanage in Manila on Tuesday. “Chillin’ with my homies,” Madonna said in a caption to an Instagram selfie with three children, as they lay on cardboard mats on the floor of Bahay Tuluyan, home to about 500 abused or abandoned children. Wearing head-to-toe black and oversized shades, Madonna came with an entourage of 20 dancers and burly bodyguards, Bahay Tuluyan executive director Lily Flordelis told AFP. “The children were very happy to see her. She played with them, danced with them and chatted with them,” Flordelis said. Madonna also visited the Hospicio de San Jose, one of Manila’s oldest orphanages. She posted a picture of herself carrying a baby in pink overalls while holding the hand of an emaciated girl, also in pink, whom she identified as Celeste. Madonna is touring the world to support her 13th studio album, Rebel Heart, which combines her trademark sexually charged lyrics and imagery with an array of musical genres. 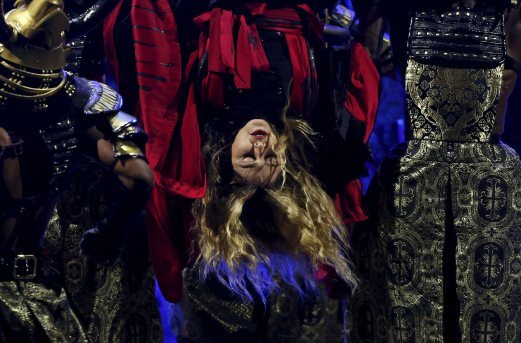 Madonna has courted controversy since bringing her tour to Asia this month. A Catholic bishop in Singapore called for a boycott of her concert for insulting religion.